My main concern is how well the outer materials hold up to the sun. I've been using a set of Hobie covers since 2010, and, while most Hobie stuff is top-notch, these haven't held up very well. (I won them at a regatta raffle....would be pretty disappointed if I'd bought them). Thanks! Don't know about those but Chuck and I both use the Murray's nacra rudder covers. Mine have spent more time in the box than in the sun over the last 7 years. They would not have lasted had they been in the sun. Chuck's are falling apart. Guess that's why they are not on the website anymore. I've got a set of Aquata covers that are on my spare gen 1 rudders that look great and seem well made, but have never been in the sun. Can't find Aquata equipment anymore though. After some research and opinions from friends I pulled the trigger on a pair of rudder covers from Slo. They look well constructed and slightly larger and thicker than the Hobie or Murrays made ones. $60 was a good deal too! To get any kind of cover to last in the sun daily is difficult. Even the high dollar Sunbrella or Top Gun material is only guaranteed for 5 years. And if the thread is not Tenara, even less. Rudder covers can last 20 years in the cat box. Sunbrella has a 10 year warranty. Edited by jaybird1111 on Sep 06, 2016 - 07:41 PM. Yup....I'm a little surprised that no one is making them out of Sunbrella or similar. It has worked well at covering my tramp/hulls but not trapping moisture. I bought a set of "homemade" rudder covers (no padding) for $20 off Ebay 15+ years ago...they've been in the sun the whole time and are still intact (including the webbing and clips)....now on my daughter's H14T. Seems the readily available ones these days are more about the padding than the sun protection. I share the concern about them staying wet too much, but I sail often enough that I'm not removing the rudders except for travel. And this isn't my kind of DIY, so I'll probably try the ones from Murray's and see how it goes. Have held up beautifully inside and out after being in the elements pretty much 24/7. They must have caught on, too, 'cause I only paid $60 for them back then! Exactly, and especially in a beachcat mast-up storage situation. Gelcoat is not waterproof. It slowly allows water to pass through to degrade core materials, if the material under it will allow - like the wood in rudders and centerboards. seems like loose sunbrella sleeves (really, about all my sewing skills can deliver) would give the UV protection needed for mast-up storage? my usage is inland lakes in CA and mast-up trailer-sail well off the water... moisture is way less an issue than UV. Randii seems like loose sunbrella sleeves (really, about all my sewing skills can deliver) would give the UV protection needed for mast-up storage? 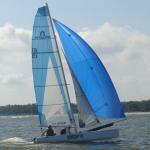 My covers are padded only because I store my rudders in the fiberglass catbox with the sails lying on them. randii seems like loose sunbrella sleeves (really, about all my sewing skills can deliver) would give the UV protection needed for mast-up storage? my usage is inland lakes in CA and mast-up trailer-sail well off the water... moisture is way less an issue than UV. This is exactly what I would have preferred but could not locate. Surprised no one sells 'em. For the record, though, I've had no trouble with moisture (only UV) using padded covers for 20+ years on plastic, EPO, and fiberglass rudders (exposed mast up storage 24/7). Sure beats having the sun eat them up.